Trucking accidents are often severe and life-changing. In the blink of an eye, your entire world can be turned upside down, causing you a lifetime of pain, suffering, and disability. While you are struggling to recover from your injuries, insurance companies may begin pressuring you to sign a quick and easy settlement. They know how traumatic trucking accidents can be and they also know that trucking accident victims need money now to pay for medical expenses, rehabilitation, and lost wages. They use this knowledge to lowball trucking accident victims into accepting a settlement that is far below what they truly need to recover. At McDivitt Law Firm, our trucking accident lawyers know the tricks that insurance companies use to reduce their liabilities. We use this knowledge to fight for trucking accident victims and to ensure that their rights to compensation are protected throughout the legal process. We have the resources and knowledge needed to tackle these large and complex cases – and win. After a devastating trucking accident, valuable evidence, such as driving logs and black box data, can be lost or destroyed. Trucking companies are well aware that this evidence is often critical to establishing liability and proving negligence. Hiring an attorney can ensure that you have the evidence you need to win your case and collect the money you deserve after a catastrophic accident. Your Colorado trucking accident attorney will investigate all aspects of your accident, gather evidence, speak to accident experts and medical professionals, and build a solid case against all negligent parties. For over 40 years, the trucking accidents lawyers at McDivitt Law Firm have been staunch legal advocates for trucking accident victims across the state of Colorado. Our experience enables us to quickly and efficiently negotiate a fair settlement for our clients. We will work tirelessly for you and your family during this difficult time, to ensure that you have the money you need both now – and in the future. We have experienced trucking accident litigators who have successfully fought against large trucking companies for decades and our track record speaks for itself. According to the National Highway Traffic Safety Administration, 4,317 people lost their lives in trucking accidents across the country in 2016 – a 5.4% increase from the previous year. Large commercial trucks can weigh up to 80,000 pounds, while passenger vehicles weigh a mere 3,000 lbs. Due to this size and weight discrepancy, it is no surprise that 72% of all trucking accident fatalities were occupants in the other vehicles. Even worse, 80% of all fatal trucking accident involved multiple-vehicle crashes. If you’ve been injured in a trucking accident, it can be difficult to know where to turn to for help. The steps you take after an accident can have a significant impact on your ability to file a claim and may even jeopardize your case. Hiring an experienced trucking accident lawyer to protect your rights throughout the legal process is an important and necessary step after a catastrophic accident. However, before you hire an attorney, your first call should be to 911 or file a police report. Calling 911 will alert both the authorities, as well as emergency response teams to your accident. Your case will benefit greatly from both a police report and a medical examination and prompt medical treatment is key to reducing the risk of further complications. Fatigued truck drivers – The National Transportation Safety Board estimates that up to 40% of all trucking accidents are caused by driver fatigue. Truckers are routinely pushed to drive long hours in order to make their deliveries on time. As a result, they may break the FMCSA rules and regulations regarding rest breaks and driving time. Driving under the influence of drugs or alcohol – Numerous studies between 2000 and 2013 showed that truck drivers routinely use drugs and alcohol to help them combat the loneliness on the road. Poor weather conditions – Snow, ice, sleet, and heavy thunderstorms can all increase the likelihood of getting into a serious and catastrophic trucking accident. 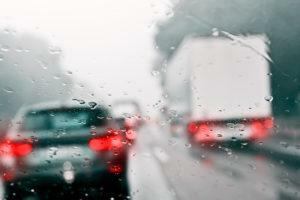 Even heavy winds can cause a truck to tip over or jackknife on the road. Speeding – Driving over the posted speed limits is dangerous. Speeding reduces the driver’s ability to make sudden corrections on the road, avoid an obstacle, or stop suddenly in traffic. It is estimated that 16% of all fatal trucking accidents were caused by a truck driver with at least one prior conviction for a speeding violation. Distracted driving – According to the FMCSA, truckers who are texting while driving are 23x more likely to cause a serious trucking accident. As such, truckers who are caught violating this rule are fined heavily and could be at risk for losing their commercial license. Poor vehicle maintenance – In an effort to save money, some unscrupulous companies do not perform this maintenance. They may unhitch rear brakes, refuse to change brake pads and tires on schedule or even allow dangerous vehicles back out on the road after failing an inspection. Improperly trained truck drivers – Trucking companies have a responsibility to ensure that their truck drivers are licensed and properly trained before allowing them to hit the road. Failure to do so can result in serious accidents and injuries. Improperly trained drivers are a liability and may make poor decisions in an emergency situation. Improper loading of cargo – Shipping companies have a responsibility to load a truck correctly and safely to prevent serious accidents from occurring. Loads that are unbalanced, overweight or unsecured can cause a semi-truck to lose control, rollover, jackknife, or fall off of bridges and trestles. Load-shifting accidents are almost always preventable. Trucking defect or malfunction – Trucking manufacturers should issue recalls when there is evidence to suggest that their product presents a significant danger. Defective trucking parts can result in fires, tire blowouts, bolt failures, and explosions. Victims of trucking accidents often sustain serious and life-threatening injuries, due to the violent forces in these collisions. Even low-speed trucking accidents can cause complicated and critical injuries to passenger vehicle occupants, pedestrians, and bicyclists on the road. Traumatic brain injuries – Traumatic brain injuries can cause permanent impairment and disability,and in some cases death. Victims who sustain a serious brain injury may be unable to work in their chosen profession, unable to enjoy their hobbies and lifestyle, and may even require daily assistance with basic care. Spinal cord injuries – Spinal cord injuries can result in permanent and complete paralysis. Victims may have difficulty walking, talking, breathing, and controlling their bodily functions. They may suffer from excruciating and debilitating nerve pain, numbness, and loss of motor control. Disfigurement – Trucking accidents are often catastrophic and accident victims may sustain serious abrasions, burns, and lacerations that can result in permanent disfigurement. These injuries may require numerous skin grafts, reconstructive surgeries, and therapies to heal, thus placing an increased financial burden on accident victims and their families. Internal organ damage – The impact of the trucking accident can result in internal bleeding and organ damage. From liver damage to ruptured spleens, the body is not made to withstand such violent forces. Internal organ damage can be life-threatening and can cause permanent disability and dysfunction. Broken bones – Fractures in a trucking accident can be catastrophic. Bones can become shattered, causing injured victims to undergo extensive surgeries and hospitalizations. In addition, if fractures are severe, accident victims may suffer permanent mobility impairment for the remainder of their lives. 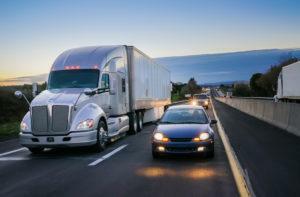 Psychological injuries – Being involved in a trucking accident can be devastating and traumatic. As such, victims of these violent crashes often experienced post-traumatic stress disorder, depression or anxiety months and even years after the accident. These psychological injuries can affect nearly every aspect of a victim’s life, rendering them unable to work or maintain relationships. An experienced and skilled Colorado trucking accident attorney at McDivitt Law Firm can help you obtain the compensation you need to pay for medical expenses, long-term care, future medical costs, rehabilitation, lost wages, loss of future earnings, and pain and suffering. Without a proper and thorough investigation led by an experienced legal team, you may not be able to recover the money you need. Who is to blame for my trucking accident? When a trucking accident occurs, there may be multiple parties to blame for the accident and your injuries. The truck driver, trucking company, shipping company, and truck manufacturer could all be to blame for the crash. An experienced trucking accident attorney can investigate your accident closely to determine all parties responsible for your injuries. How long do I have to file a claim? In the state of Colorado, you may have as little as 180 days to file a claim. If you have been injured in a trucking accident, it is important to speak to an experienced Colorado trucking accident attorney immediately to determine if you can still file a claim. What if I am partly to blame for the trucking accident? If you are partly to blame for the trucking accident, you may still be eligible for financial recovery. If you are 50% responsible for the crash, however, you will not be able to collect damages following the accident. Should I accept the settlement offered to me? If the insurance company has offered you a settlement, do not sign it without first speaking to an attorney at McDivitt Law Firm. The insurance company is not on your side and does not have your best interest at heart. We will review your accident and your injuries to ensure that you are compensated fairly. I can’t afford a lawyer, what do I do? At McDivitt Law Firm, our truck accident lawyers work on a contingency basis. This means that you don’t pay us anything until we win your case for you. When we win or settle your case, our fee is just a percentage of your total settlement. With a lawyer on your side, you will see a significantly higher settlement package – up to 3x as much as those who settled without an attorney. At McDivitt Law Firm, we’ve been helping injured trucking accident victims throughout the state of Colorado obtain millions of dollars after a serious accident. We offer aggressive legal representation throughout every phase of the legal process, so you can rest assured knowing that your rights are protected every step of the way. From the moment you call us, we will begin fighting for you. Insurance companies are not on your side after a serious trucking accident. That’s why you need an experienced trucking accident lawyer on your side from the very start. Contact the McDivitt Law Firm auto accident attorneys in Denver, Aurora, Colorado Springs, Northern Colorado Springs or Pueblo as early in the process as possible. 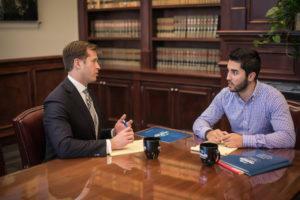 We offer a free consultation and review of your case, so we can discuss all of your legal options. McDivitt should be the kind of attorney that all clients get. My case manager was outstanding and did a great job. My attorney did everything he could do and provided great customer service. He took a bad experience and turned it around.